I love fragrance and I love what I wear to be natural when possible. So I have made a range of boutique natural perfumes to reflect creativity, taking inspiration from the many colours I use when I paint. I love knowing that the essential oils I’m using smell beautiful and also promote well-being through their therapeutic qualities. I use organic therapeutic quality essential oils where possible and certified organic carrier oils. When therapeutic grade options are not available I use certified cosmetic grade — all 100% natural! I do not use synthetic fragrance. NOTE: Therapeutic grade essential oils are beneficial for health when absorbed through the dermal layers of skin, but it is wise to patch-test all essential oil products first in case of reaction due to sensitivity - as is recommended for all skin products available on the market, organic or otherwise. Due to the 15-20% essential oil content this is an Eau de parfum. Essential oils are suspended in pure alcohol to allow the many subtle notes to be detected. 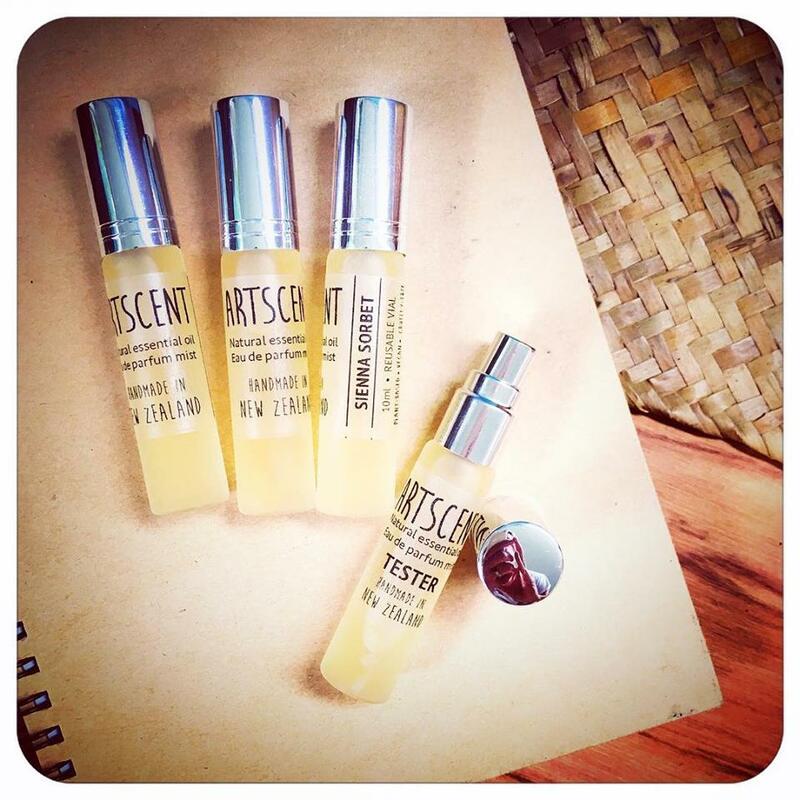 There are no other preservatives or fillers used in these mist perfumes. Aged for 1 month before release to ensure all the oils are well-blended to create a harmonious fragrance. Due to the 15-20% essential oil content this is an Eau de parfum with an oil base. Essential oils are infused into organic, cold-pressed Hemp and Jojoba oils for their myriad benefits to skin. Cold pressed Meadowfoam seed oil helps to create a stable shelf-life. There are no other preservatives or fillers used in these roll-on fragrances. From 20th January 2018, fragrances will be stocked at Kumeu Art Centre, 300 Huapai Rd, Kumeu, Auckland. I am happy to make to order in small quantities, please contact me for information.